Last night, Ryan was supposed to appear on television. When we are not cooking in the kitchen, he frequently goes out to audition for tv shows and commercials, and recently he booked a role on the new comedy Powerless on NBC. We alerted our friends and family to let them know the episode was airing, heated up some food from a photo shoot, got cozy on the couch, and waited the big moment. But by the end of the first scene, he realized it wasn’t the right episode, even though all the online tv listings said it was. We’ll figure out when it’s going to air, and let you know when you can see it. Over the years, he has played everything from a demon slave on Angel to a homeless thief on CSI who gets caught breaking into a stranger’s home and raiding their refrigerator. Hopefully, his sporadic audition schedule fits around our new weekly show on Instagram. 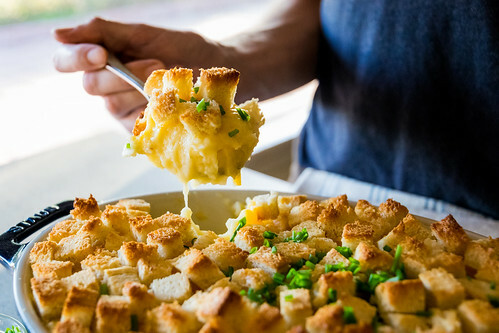 Every Friday at 12pm PST, we have been going live from our kitchen and making a new recipe. 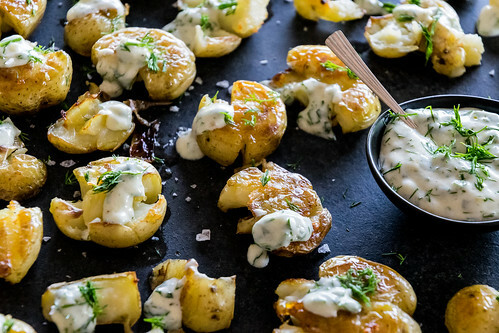 Today is the fourth episode of Friday Live With Husbands That Cook, so please join us as we make this delicious treat: crispy smashed potatoes with herbed yogurt. Being a vegetarian in Spain is not easy, but if you know what to look for you can eat like a king. Ryan has family in Bilbao and we have been fortunate to visit them a few times together over the years. Our first experience was in the summer of 2011, and while the trip was amazing… getting there was not. Thanks to weather and other delays, our sixteen-hour travel time turned into an unpleasant (and uncomfortable) thirty, leaving us exhausted and worn out by the time we arrived. But the huge hugs and warm welcome we received from all the relatives waiting at the airport made us forget the ordeal we had been through, and for the next four days we had the time of our lives. We had planned our trip to overlap with the city’s annual festival, Aste Nagusia, or “big week.” From morning till night, there were tens of thousands of locals and tourists partying in town, with colorful floats, jaw-dropping fireworks, and delicious street foods on every corner, and this is where Adam tried churros con chocolate for the first time: thin, extra-crispy churros dipped in a cup of rich, thick melted chocolate. Ryan’s family showed us all their favorite local bars and restaurants, took us to the Guggenheim Museum of modern art, and we basically spent the entire visit eating and drinking our way through this lively Basque city. 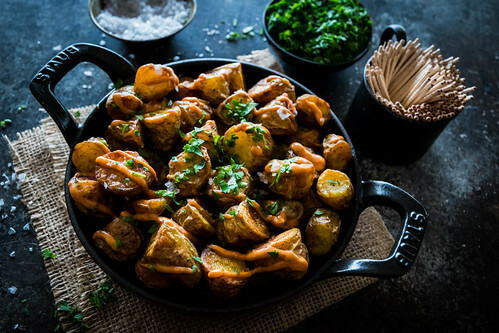 At times, it was tricky to find tapas that we could eat, but almost every bar had a few classic dishes we could enjoy, like traditional Spanish tortilla de patatas, roasted pimientos de país, and the crispy, spicy, dangerously addictive potatoes known as patatas bravas. Last week we hiked to Hermit Falls. This scenic 2 1/2 mile adventure through the forested canyons above Monrovia is one of our favorite places in Los Angeles. With majestic views of the San Gabriel Mountains, we walked through emerald fern-lined paths, winding our way through shady oaks, carefully crossing over several running streams before reaching the thirty foot waterfall at the end of the trail. The lush setting felt more like Kauai than Southern California. Here we were, high above the city, away from the noise, trying to work off the massive amounts of apple cider snickerdoodles and chocolate peppermint parfaits that were consumed during the holidays. And in those ancient hills—still sparkling like diamonds from the recent rains—the idea for this magical creation was conceived as we hiked along the babbling creek. 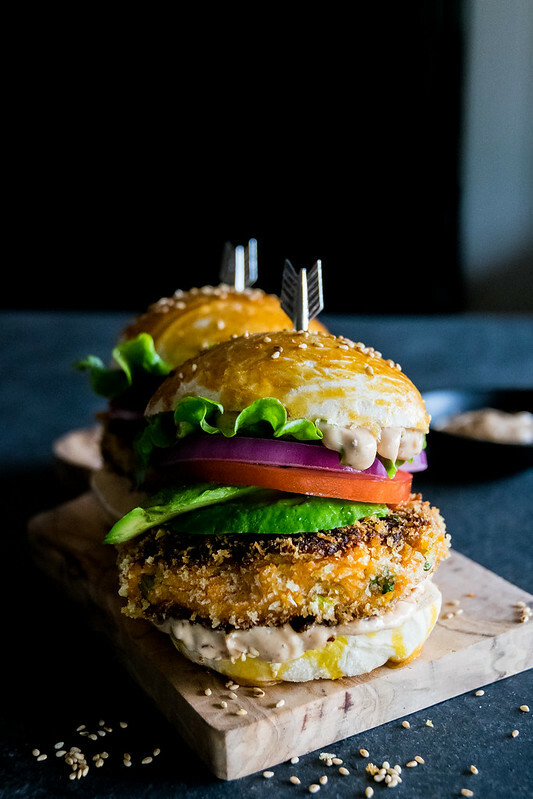 We tested it for dinner as soon as we got home, and from the first blissful bite it was clear: they are hands down some of the best burgers we’ve tried. We just checked the official Thanksgiving Rule Book, and in Article 1, Line 3, it clearly states, “Sweet potatoes must be included on the table in order to qualify as a true Thanksgiving feast.” This detailed book covers all the basics: Must have at least one type of stuffing. Each slice of pumpkin pie shall be topped with a dollop of whipped cream. Omitting the green bean casserole is forbidden and will incur penalties. There is also a great section on how to say the appropriate thing when giving thanks, as well as informative chapters on how to deal with drunken relatives. Everything is covered here: from how to quickly and smoothly change the conversation topic from politics to funny youtube videos, to tips on being polite if the turkey happens to be dry. This delicious recipe has been a tradition in Ryan’s family for over 40 years, and Thanksgiving truly wouldn’t be the same without it. 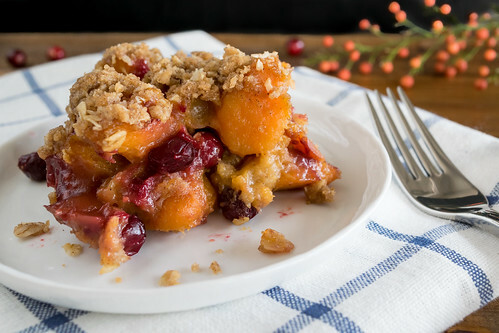 And according to the official Rule Book, this dish qualifies as the perfect sweet potato casserole: filled with tender sweet potatoes tossed with fresh ripe cranberries, covered with a cinnamon and brown sugar oat crumble, and baked until the cranberries soften and burst, releasing their ruby-colored juice, which bubbles under the crisp, crunchy warmly-spiced topping.